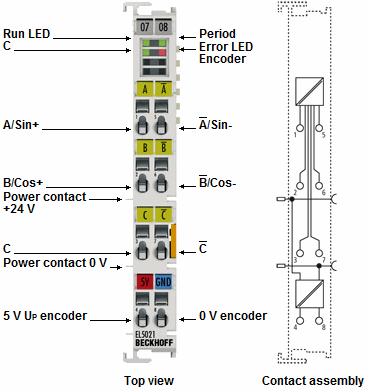 The EL5021 SinCos EtherCAT Terminal serves as interface for the direct connection of a measuring sensor, e.g. a measuring probe with sinusoidal voltage output 1 Vss to the higher-level fieldbus. The measuring signal is processed, interpolated and made available as a 32 bit value. The signal period resolution is 13 bit. The reference mark is also stored in a 32 bit value. The current count and the reference mark value can be read. The input frequency for the measuring signal inputs is 250 kHz. The EL5021 deals with offset, gain and phase error compensation.